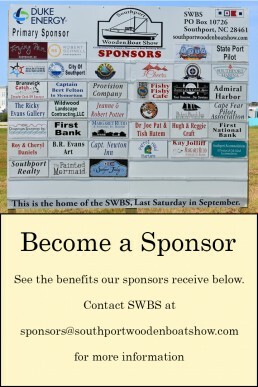 Amongst the benefits listed below, both Financial and In-Kind Sponsors should take advantage of the discounts offered by the State Port Pilot for advertising in the SWBS Program Insert. The Program Insert not only gets you exposure to it’s normal 7500+ copies sold weekly, but the insert is also passed out on Event Day to the vast majority of attendees, which last year was estimated over 10,000. With the discount, this is pretty good distribution for that reduced rate. The SWBS has determined that the use of PayPal for making a Financial Donation is not cost effective and will require the traditional completion and mail-in of Financial Donations accompanied by a check or money order. In addition to the personal contact form of soliciting your support with an In-Kind donation, you now have the ability to complete & submit a form on-line that describes your intended donation and how to be contacted. NC Statutes prohibit the SWBS from establishing the value of goods or services donated for tax deduction purposes so a space has been provided for the donor to do so the SWBS can send you a form with your declared value after the event. For additional vendor information, contact us at: sponsors@southportwoodenboatshow.com.